As we have pointed out before, the hypothesis that investors in stock or bond funds might redeem heavily during a market downturn—thus destabilizing financial markets—is an old one, dating back to the 1920s. We’ve also noted that there isn’t much evidence of this, and that there is a fair bit of evidence against it. Still, the BoE’s latest paper contends that if open-end bond funds saw redemptions equal to 1 percent of their assets over one week—about equal to aggregate outflows from European corporate bond funds during the depths of the financial crisis—then the yield spread between investment-grade corporate bonds and government bonds could increase by about 40 basis points (0.40 percent). Moreover, the paper says that slightly larger investor redemptions—1.3 percent of assets during a given week—could cause dysfunction in the corporate bond market. The paper has attracted some attention in the media, and the BoE has solicited feedback. This ICI Viewpoints offers a preliminary discussion of some issues surrounding the BoE’s analysis. The paper is “an incomplete exercise.” The BoE itself admits that its simulation model is a pilot step, “and so is an incomplete exercise.” It has some new and interesting features—such as seeking to model how readily hedge funds and dealers could in theory accommodate heavy sales of corporate bonds by open-end investment funds—but at this point, an in-depth critique is not possible because the paper provides too little detail (see below). As the BoE itself acknowledges, it is too soon to use simulations like those in the paper to reach policy conclusions. Assuming that correlation implies causation is a key concern. Bond fund flows are indeed correlated with bond market returns (see Figure 2.8 in the 2017 Investment Company Fact Book). But correlation does not mean causality. Researchers have sometimes assumed that this correlation arises because fund flows cause bond market returns to move and that the size of this causal “feedback” is measurable, known, and well-understood. But that’s not supported by empirical evidence. In this case, it seems that the BoE’s model must make such an assumption—thus effectively driving its results—but unfortunately there’s not enough detail in the paper to confirm what assumptions the authors are using. For example, the paper does not spell out the assumptions in a key equation (equation 1 in Annex 1) that specifies how corporate bond prices are assumed to respond to funds’ sales of such bonds. The BoE should provide more details, so that stakeholders are better able to provide feedback. The model appears to focus on euro-denominated corporate bonds. Somewhat curiously, given the BoE’s purview, its model appears to focus not just on sterling-denominated corporate bonds but also on euro-denominated corporate bonds. This makes a difference. The solid gold line in Figure 1 below shows monthly flows to open-end bond funds that invest primarily in investment-grade corporate and government bonds denominated in either euros or pounds sterling. The pattern closely matches what the BoE’s paper depicts. As seen, outflows reached 4.7 percent of these funds’ assets in October 2008, the crisis month on which the BoE’s paper concentrates. 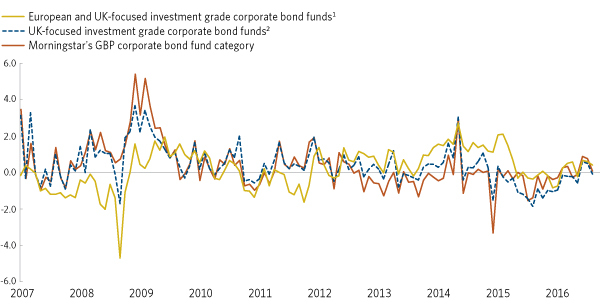 The dashed blue line in the figure separates out monthly flows to open-end bond funds that invest primarily in investment-grade corporate and government bonds denominated only in pounds sterling. In that case, outflows in October 2008 were only 1.7 percent of those funds’ assets. 1Data include the following Morningstar categories, which had an average of 20 percent or more of their portfolios invested in corporate bonds as of March 2017: Convertible Bond–Europe, EUR Cautious Allocation, EUR Cautious Allocation–Global, EUR Corporate Bond, EUR Corporate Bond–Short Term, EUR Diversified Bond, EUR Diversified Bond–Short Term, EUR Flexible Bond, Europe Bond, GBP Cautious Allocation, GBP Corporate Bond, GBP Diversified Bond, and GBP Flexible Bond. 2Data include the following Morningstar categories, which had an average of 20 percent or more of their portfolios invested in corporate bonds as of March 2017: GBP Cautious Allocation, GBP Corporate Bond, GBP Diversified Bond, and GBP Flexible Bond. Note: Data exclude money market funds, exchange-traded funds, and funds that invest primarily in other funds. Why did funds investing in euro-denominated bonds have larger outflows? Government guarantees of banks may be one factor. In October 2008, many countries provided guarantees of banks, although details varied widely. Media reports indicate that guarantees introduced in Germany and Italy drew money from open-end bond funds into bank deposits. In addition, banks—which dominate retail sales of mutual funds on the European continent—may have pushed the sales of mutual funds to the sidelines, instead encouraging customers to place their assets in bank deposits, perhaps in an effort to shore up those banks’ deposits. These factors could help explain why outflows from UK-focused investment-grade corporate bond funds were more modest in October 2008. Also, part of the outflows in October 2008 may have been a reaction to the stock market collapse that month. The BoE has defined an “investment-grade corporate bond fund” as one holding at least 20 percent of its assets in corporate bonds. As a result, some of the funds in the BoE’s analysis (and therefore also in Figure 1) hold a substantial portion of their assets in securities other than bonds (e.g., equities). It’s possible to avoid this issue by looking at the Morningstar GBP bond fund category, a category whose funds are available for sale in the United Kingdom and invest primarily in sterling-denominated corporate bonds. As Figure 1 shows, that category saw inflows during October 2008. In other words, the BoE’s decision to include euro-denominated bond funds and funds that hold significant equity stakes clouds the analysis. We think the BoE should investigate these possibilities and fold them into its analysis. Alternatively, the BoE could avoid the issue altogether by refocusing its analysis exclusively on the sterling-denominated corporate bond market. The paper links fund flows to corporate bond yield spreads, rather than corporate bond yields. The BoE’s model apparently simulates the effects of redemptions from open-end bond funds not on corporate bond yields, but on corporate bond yield spreads. The difference is important. The corporate bond yield spread equals the yield on corporate bonds minus the yield on government bonds. Thus, during a crisis, corporate bond yield spreads may widen because corporate bond yields rise, because government bond yields fall, or some combination. Generally, during periods of market stress, government bond yields will decline, reflecting the demand of all investors for the liquidity and safety of government bond markets. As a result, during periods of market stress, corporate bond yield spreads likely will widen even if open-end funds do not sell a single quid or euro’s worth of corporate bonds. 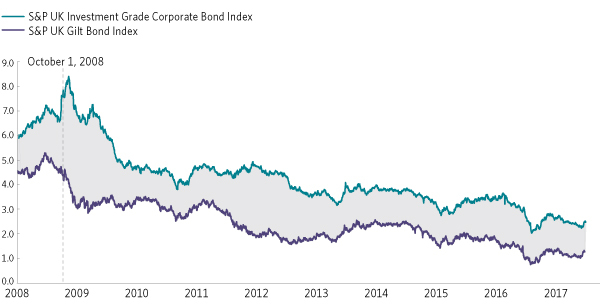 To illustrate, in the United Kingdom in October 2008, investment grade corporate bond yield spreads widened significantly (to 95 basis points), but a significant portion (22 basis points) of the widening owed to a decline in government bond yields (see Figure 2, above). These effects were even more pronounced for the yield spread on euro-denominated investment-grade corporate bonds; by our calculation, that spread widened by 73 basis points in October 2008, of which the great majority (56 basis points) was due to a drop in government bond yields. We would recommend that the BoE clarify whether and how it deals with this issue. The paper’s sensitivity analysis shows that assumptions matter. It is common with simulation models such as the BoE’s to provide a sensitivity analysis (i.e., to change a model assumption and see how the results vary). Though it would be preferable to see statistical confidence intervals around model results—is the probability of a 40 basis point increase in yield spreads 99 percent or is it 1 percent?—with these kinds of simulation models, a sensitivity analysis usually is all that can be done. The sensitivity analysis in the BoE’s paper seems to suggest that the results are rather sensitive to the model’s assumptions. For example, the paper tests the model’s sensitivity to alternative assumptions about how funds meet redemptions. The baseline assumption is that funds meet redemptions by selling a vertical slice of their portfolios (i.e., they meet a 1 percent redemption by selling 1 percent of each bond issue that they hold). If the model instead assumes that funds partially use cash to meet redemptions (as is likely the case in practice), the predicted rise in corporate bond yield spreads is less pronounced (27 basis points instead of 40). The BoE could check the sensitivity of its results to the factors we have discussed here. For example, it could ask, how do the results change if corporate bond funds see much smaller or no outflows, such as those seen in October 2008 in UK-focused corporate bond funds? Most importantly, though, the BoE should examine how its results would change if—as a range of papers have suggested—the correlation between bond fund flows and bond returns arises primarily from investors reacting to bond returns, rather than vice versa. More work needs to be done. To reiterate, the BoE’s new model provides preliminary results—and it’s too soon (as the BoE itself emphasized) to use these simulations to reach policy conclusions. Hopefully, our analysis will help readers put the BoE’s paper in context, and provide useful suggestions for those who are examining stress testing of open-end investment funds. A recent post on the blog of the Federal Reserve Bank of New York discusses the possibility that new rules by the Securities and Exchange Commission (SEC) allowing money market funds to temporarily impose fees or gates during times of market instability could increase the risk of preemptive runs on such funds during times of stress, rather than helping to limit destabilizing withdrawals, as the SEC intended.